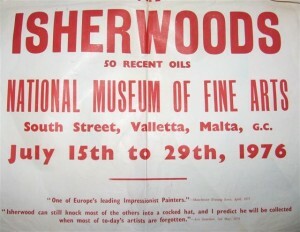 It is well-known that throughout his life, Isherwood found it difficult to sell his paintings. And so many were in his home in Wigan, it was impossible to discover if any had been stolen following a break-in. The local evening paper – The Post and Chronicle – in the artist’s home town broke the story after police had made the theft public. At the time Isherwood was with Pat White, the woman he told the world he had married (he didn’t). Mystery frames the fate of a top painter’s personal art collection. The artist Jim Isherwood’s collection of the paintings he refuses to sell could have been stolen from his home while he is holding an exhibition in Malta. No-one is sure when he and his wife expect to be back in England. Now, police in Wigan and the artist’s brother Gordon are awaiting his return to see if any paintings were taken. Since they missed one flight back, the Isherwoods have decided to stay on while the artist works there. For other reasons they cannot return until at least the middle of next week but Mr Isherwood is very worried about his collection. The artist, who presented a portrait to Maltese Prime Minister Dom Mintoff last Friday is living in St Julian, Malta. He said: “What has happened to my set of paintings is a mystery. I have refused to sell many of them. My paintings have always meant more to me than cash – some are off Old Wigan, which I have refused to sell. The problem still facing the painter, who has been appearing on Malta TV and radio, is that there is no way of solving the mystery until he gets home. A follow up story did not appear in subsequent editions of the paper. 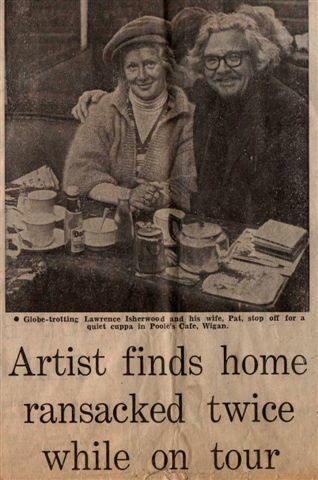 But in the edition of the Post and chronicle for October 13, 1977, a photo of Isherwood and his “wife” appeared on page 9 and a story under the headline “Artist finds home ransacked twice while on tour. Painter Lawrence Isherwood and his wife Pat returned to their Wigan home to find thieves had stolen hundreds of pounds worth of property. Mr Isherwood said the house was littered and strewn with ornaments and clothing. They are only two of a string of burglaries to hit the Isherwoods. But the calamities have not marred their new life together, Mrs Isherwood said. For some time they have been touring Italy, Malta and Spain, where Mr Isherwood has held exhibitions of his impressionist paintings which he achieves with palette knife and brush. Mrs Isherwood has occasionally displayed some of her paintings which she does in an amateur capacity. The Magdalen event is special because it is Mr Isherwood’s 200thshow and it coincides with the couple’s second wedding anniversary.